Artists Susannah Sayler and Edward Morris (Sayler/Morris), faculty members in the College of Visual and Performing Arts’ (VPA) Department of Transmedia and co-directors of the Canary Lab, a hub for research-based, interdisciplinary art and media focused on ecology, have received two major honors for their collaborative work. 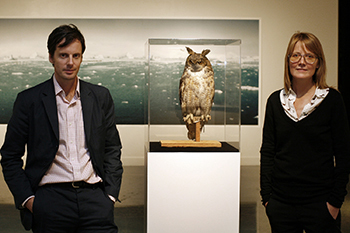 Sayler/Morris are the recipients of the 8th Annual Art/Act Award and Exhibition from the David Brower Center in Berkeley, California, for the Canary Project, a research-based initiative they created that produces art and media about such ecological issues as climate change, extinction, food systems and water resources. The duo also received a 2016 New York Foundation for the Arts (NYFA) Artists’ Fellowship in photography. The Art/Act Award and Exhibition was created to honor established artists who have dedicated a significant part of their careers to making art that inspires environmental advocacy and engagement. Past honorees include Maya Lin, Richard Misrach and Edward Burtynsky. Sayler/Morris will have the exhibition “Art/Act: The Canary Project” at the David Brower Center Sept. 23-Feb. 9, with an opening reception on Friday, Sept. 23, from 6:30-8:30 p.m. 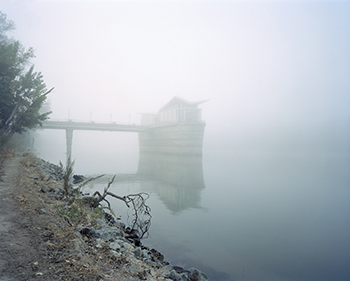 The exhibition presents an overview of the Canary Project work and a more in-depth look at a current project regarding water issues in California, “Water Gold Soil: The American River.” Sayler/Morris will discuss their work in a public lecture presented as part of the opening reception. The NYFA Artists’ Fellowship Program makes unrestricted cash grants of $7,000 to artists working in 15 disciplines, awarding five disciplines per year on a triennial basis. The awards are made to individual originating artists living and working in the state of New York for unrestricted use. The program is highly competitive; this year’s recipients and finalists were selected by discipline-specific peer panels from an applicant pool of 2,669. The program is administered by NYFA with leadership support from the New York State Council on the Arts. Sayler/Morris use diverse media to investigate and contribute to the development of ecological consciousness. Their work has been exhibited in numerous venues, including MASS MoCA; Cooper Hewitt, Smithsonian Design Museum; Walker Art Center (Minneapolis); Kunsthal Rotterdam; Museum of Contemporary Art Denver; and the Museum of Science and Industry (Chicago). Sayler/Morris have been Smithsonian Artist Research Fellows and fellows at the Nevada Museum of Art’s Center for Art + Environment. In 2008-09, they were Loeb Fellows at Harvard’s Graduate School of Design. The Canary Project was founded by Sayler/Morris on the belief that cultural production is a crucial building block in social movements; art opens a space for belief, and belief makes a space for change. Since 2006, the Canary Project has produced more than 20 projects involving hundreds of artists, designers, scientists, writers and volunteers. The projects communicate the immediacy, the presence and the reality of climate change while employing extensive disciplines, including photography, sound-art pieces, public intervention, performance and poster campaigns. Sayler/Morris are also co-directors of the Canary Lab. Housed within VPA’s Department of Transmedia, the lab hosts a variety of programming and offers courses open to students across the University. Each semester the lab focuses on a particular topic (food, shelter, animals, climate change, etc.). Students read, research and make projects in response to that research, often in collaboration with each other. The cross-pollination of ideas results in publications, exhibitions, events or public interventions designed by the class. The Canary Lab creates additional programming related to each semester’s themes, including workshops, sponsored speakers, symposia, visiting artists and events. Further, the lab supports relevant student projects beyond the semester and carries out multiple collaborative projects both within the University and with outside partners.